Hialeah, Fla. – Florida National University Men’s basketball team defeat Johnson and Wales University on Tuesday night 94 x 70. Final: Florida National University 94, Johnson &Wales University 70. Location: Bucky Dent Gym | Hialeah, Fla.
FNU shot 56.3% from the field overall but was hot from the field in the first half, hitting 60.5%. JWU hit 41.5% of its shots. Kaliph Fagan led FNU with 12 points off the bench, going 4-of-5 from the field and 1-for-2 from Downtown. Conquistador Player of the Week Kenneth Santos led all scorers with 22 points and got 7 rebounds. Antonio “TJ” Sims scored 17 points with 3 assists while Jeffrey Hernandez scored 15 points on 7-of-9 shooting with 5 rebounds. Nico Rojas scored 11 points but logged a game-high 8 rebounds and 2 Blocks. Men’s Basketball – Florida National University vs JWU. Let’s go Conquistadors! 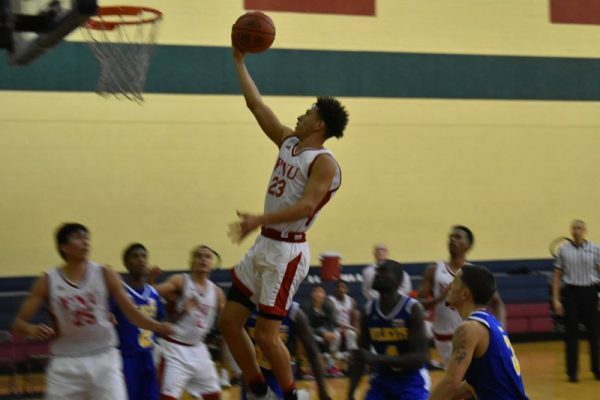 FNU Improved its record to 5-6 this season. FNU record at home was improved to 3 wins and 1 loss. Florida National out-rebounded Johnson &Wales 40-25 in the contest. The Conquistadors will face Voorhees College on Wednesday, November 21st, at Hialeah with a tip-off of 7:00 p.m.